It takes less than 10 minutes to make from start to finish, and can be easily adjusted based on your personal dietary preferences. I'll often get a craving for this one and run to the kitchen to whip it up during TV commercial breaks--it's that quick and easy! When I'm eating keto or low-carb, I use liquid stevia drops or a spoonful of a sweetener like swerve. When I'm not, I just use a spoonful or two of regular sugar. The cornstarch in the recipe adds a couple carbs, but also adds body and bit more structure to the cake. You can swap in coconut flour, if you prefer, or use another starch like tapioca or arrowroot. 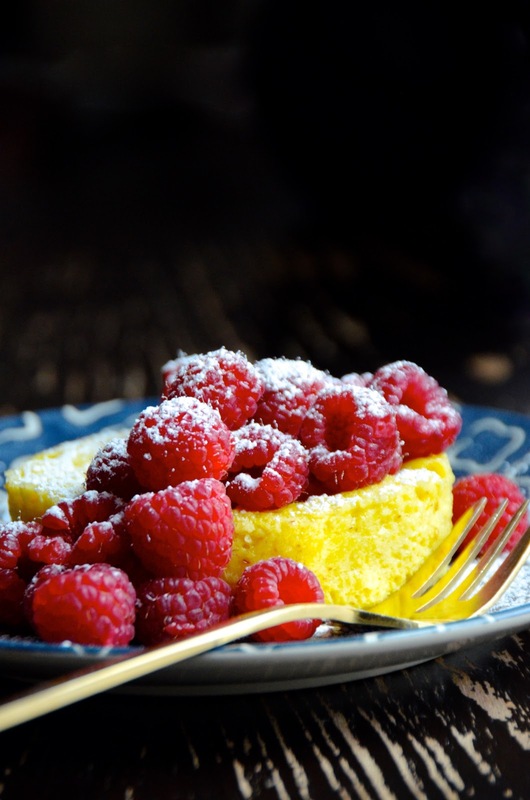 While you can enjoy the cake on its own, I think the fresh raspberries really are a necessary pairing. It's also wonderful with fresh blackberries or blueberries! How many carbs are in this flourless microwave cake? This depends on the ingredients that you choose, but will vary between 8 to 12 grams net carbs if you use stevia and coconut flour to 20 - 30 net grams of carbs if you use regular sugar and a starch. This is for the entire mini cake. Microwave recipes can be tricky because microwaves vary wildly. My 15-year-old microwave cooks much differently than a brand new one. Sizes and powers also vary. I recommend cooking at 80% and checking on it after the first 2 minutes, then every 30 seconds. You'll know the cake is ready when it has puffed up slightly, pulls away from the sides, and is set in the center. It is a pudding cake so it will be a bit damp and spongy in the inside so don't try to use a cake tester. Once you make it once or twice, you'll figure out the perfect timing for your microwave! OK...go make yourself a tiny cake now! Makes one single-serving cake. Microwaves can vary, so read notes above and in recipe directions before starting! Recipe can be made low-carb, keto or standard. Butter a 4" ramekin, a large mug, or other small microwave safe vessel. Can also be divided into two small ramekins or custard cups (cooking time will be less). In a small bowl, whisk together butter and egg until evenly combined and pale yellow. Whisk in lemon zest, lemon juice, vanilla, salt, almond meal, cornstarch, baking powder and sweetener of choice. Transfer batter to the prepared ramekin. Microwave at 80% for 2 - 4 minutes (this will depend on your microwave--check at 2 minutes, and add more time as needed). The cake is ready when it has puffed up slightly, is fully set in the center, looks dry to the touch on top, and pulls away from the sides. Let sit 5 minutes, then gently transfer to a serving dish. 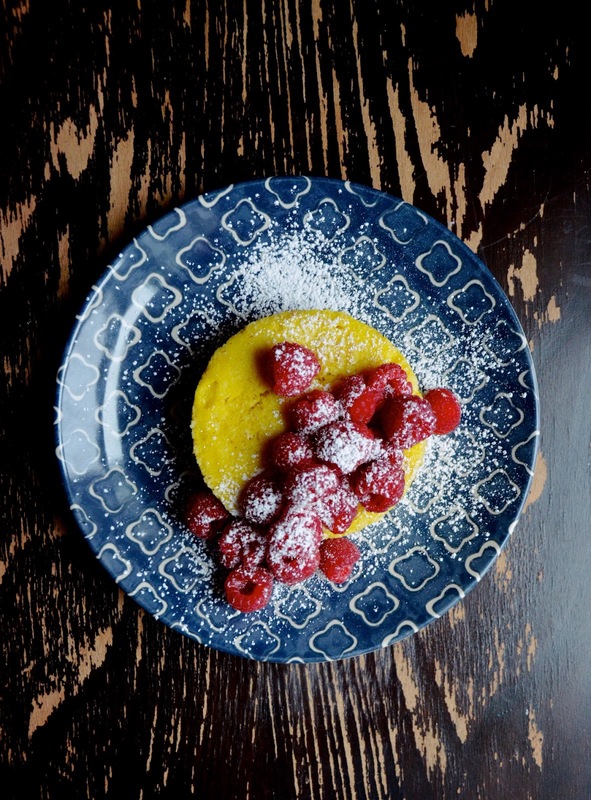 Top with berries and a light dusting of powdered sugar (if using), and serve immediately. Best served slightly warm. 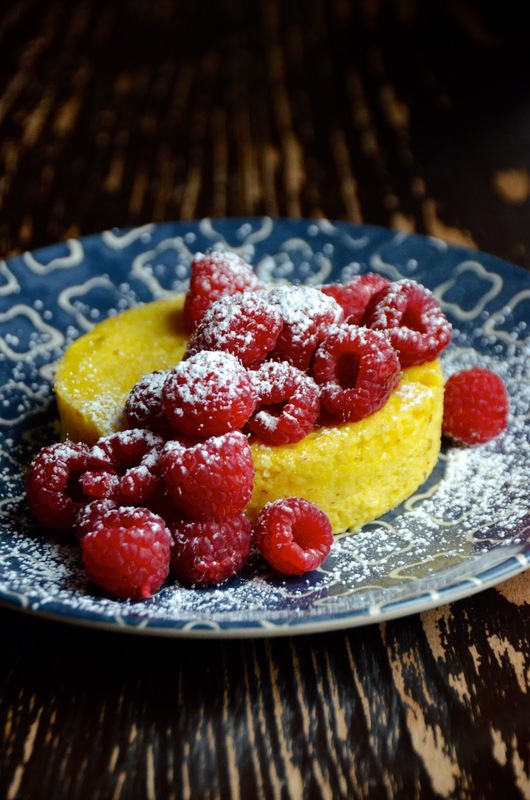 How many carbs are in this flourless microwave lemon pudding cake? This depends on the ingredients that you choose, but will vary between 7 - 8 grams net carbs if you use stevia and coconut flour to 20 - 30 net grams of carbs if you use regular sugar and a starch. This is for the entire mini cake.